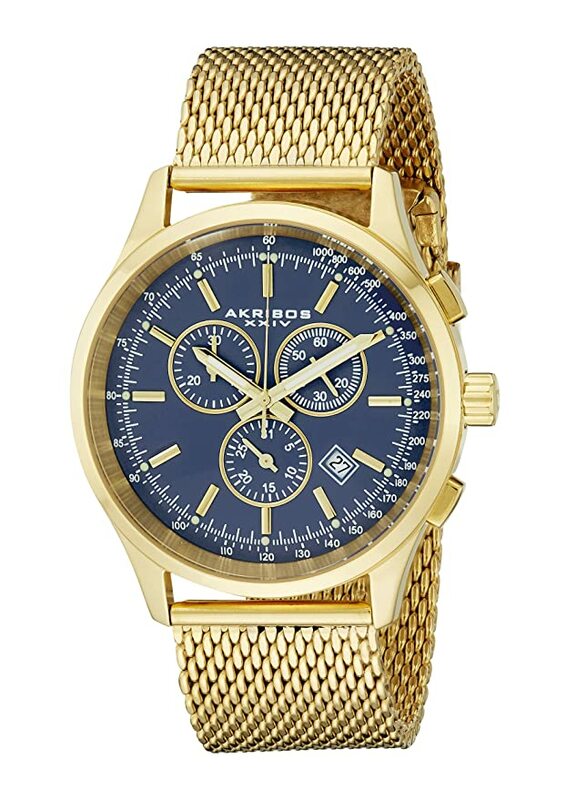 This handsome Akribos XXIV men's timepiece boasts a stainless steel case and mesh strap. 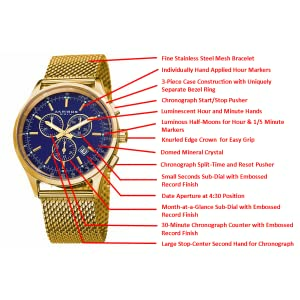 The watch features a Swiss Quartz chronograph movement with sub dials displaying a 30 minute timer, 60 second, and date. The origin of timekeeping began in Greece. The horological timeline later shifted to the gates of Rome. 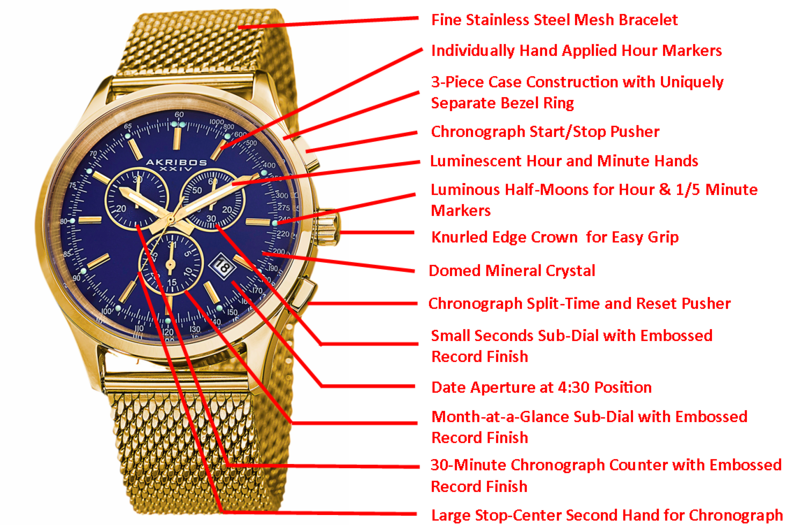 What happens when you combine the history of both cultures into one wristwatch collection? 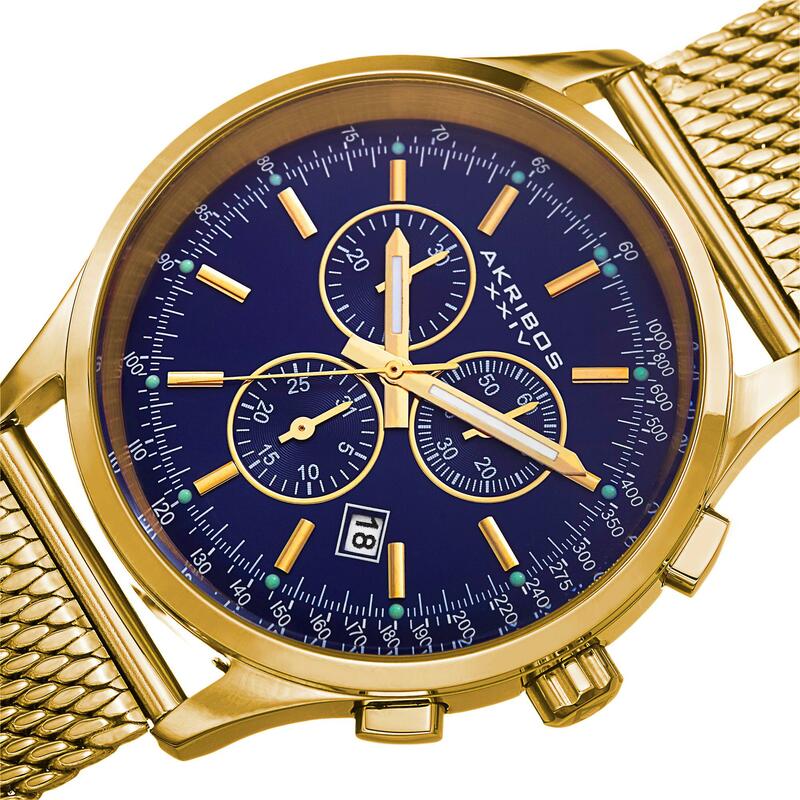 You get the Akribos XXIV Watch Collection. Akribos means “exact and precise” in Greek. The Roman numerals XXIV represent the 24 hours in a day. The AKRIBOS XXIV Watch Collection combines complicated mechanisms with bold, sophisticated designs to bring you a timepiece collection that is exact and precise….all 24 hours of the day. The Collection of oversized, daring watches filled with lots of personality and character is designed for those who are looking for excellence of style and performance that can be worn on any occasion. Designed by an experienced team of designers from around the world, the assortment has received rave reviews for the bold, industrial look of the brand that has transcended the conventional look of other watch brands. By combining the highest grades of materials with daring designs, along with the latest in movement technology, the Akribos XXIV Collection has earned a reputation among watch connoisseurs as the timepiece collection to watch…. all twenty four hours a day! 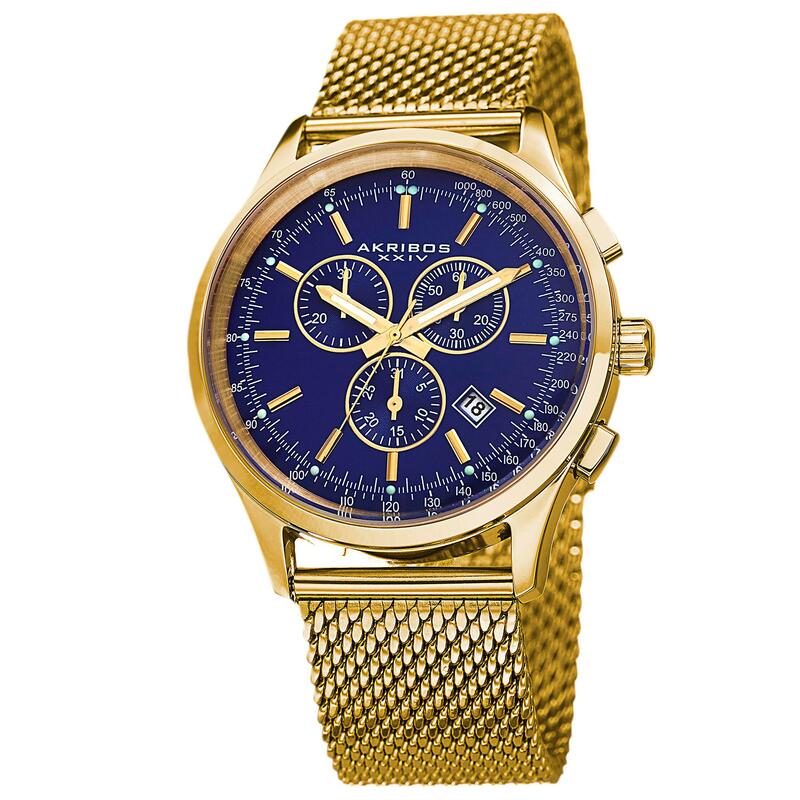 From the Akribos XXIV Haute-Monde Collection, the Monaco Chronograph presents a smart and sharp visual on the wrist for any occasion. Displaying its three-register dial and yet offering a clean look, the Monaco Chronograph features a classic size case (43mm) mounted on the collection’s signature fine steel mesh bracelet. The real star of the Monaco Chronograph, however, is the engine that powers it: the Swiss ISA 8171 quartz chronograph movement. A world class movement, the 8171 provides “add and split” functionality for taking “split timing,” and a 30-minute counter. The premium Swiss ISA movement is famous for its ultra-high pulse rate of five beats per second! Just hit the reset pusher at the 4:00 position and watch the smoothness in which the large “stop-center second hand” sweeps to reset. The 8171 also provides a double calendar function; with a numeric date-wheel exposed at the 4:30 position AND a “month-at-a-glance” sub-dial at the 6:00 position, you can see the current month at a quick and easy view. 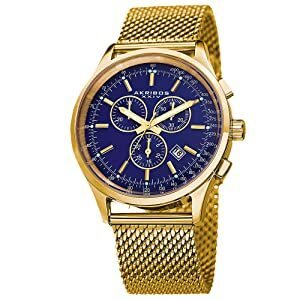 The Akribos XXIV Haute-Monde Collection of gentlemen’s fine timepieces carries a look of subtle luxury, delivering a casual elegance perfect in any setting! The craftsmanship of the Monaco Chronograph does not take a back seat to its design; both the case and bracelet are formed from stainless steel. The dial is hydraulically struck and embossed, presenting depth and dimension in the sub-dials’ concentric design. The baton-style hour markers are individually applied by hand to the main dial. The hour and minute hands are filled with Super Luminova for easy reading in the dark, and the hour markers (1/5 minute) also feature luminous half-moons. The outer seconds track hosts a printed Tachymeter for measuring the speed of an automobile. The mineral crystal is slightly domed, adding shape and dimensionality. 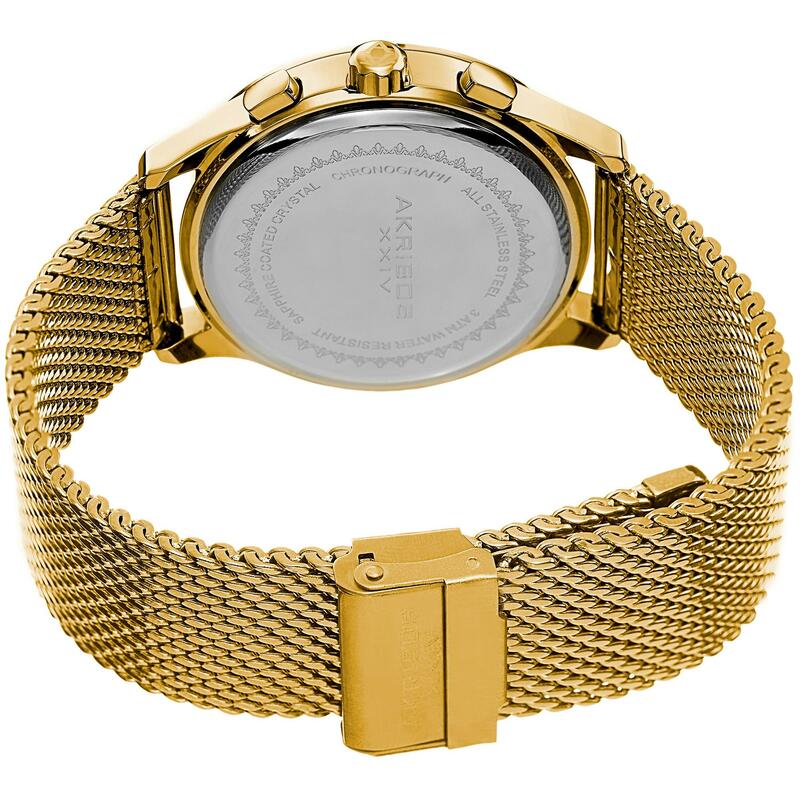 The stainless steel case-back ensures water resistance up to 30 meters. The entire look is finished with a fine stainless steel mesh bracelet and accompanying adjustable buckle, making the Monaco Chronograph a perfect fit on every wrist! All Akribos XXIV timepieces come packaged in a beautiful, plush keepsake box and carry a two-year warranty!